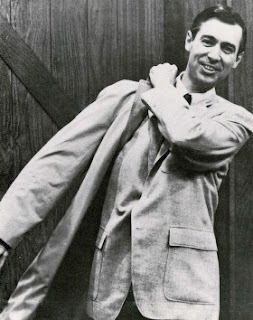 RussJones.Us: Won't You Be My Neighbor? How many of you remember Mr. Rogers? - Did you know that he was a Presbyterian minister? - He was an Ivy League drop out. He was an accomplished musician who wrote over 200 songs, all the music for his show and a kids opera. - All of the cardigan sweaters he wore were knitted by his mother. - He is credited with single handily saving Public Television by testifying at a Senate hearing. After speaking, funding jumped from 9 million to 22 million dollars. - Micheal Keaton got his start on Mr. Rogers Neighborhood. Proverbs 14:21 says Whoever despises his neighbor is a sinner, but blessed is he who is generous to the poor. Showing hospitality, or being neighborly, was and is considered a Godly quality. However, it has become something of a lost art. But you can be neighborly today. A kind smile. A generous thank you. Asking, "Can I help you in some way?" Seeing a need and filling it. Showing mercy to those who at the moment don't really deserve it. All of these are neighborly things. Look around you today and see how you can be a neighbor. Won't you be my neighbor?